Despite being actively involved in groups like G20, BRICS and SCO, the UN gives Moscow status and influence. Russia’s attitude towards the United Nations is defined by two key concerns: status and influence. Being a permanent member of the UN Security Council is crucial for both. It justifies, more than anything else, Moscow’s claim to status of a great power, whose opinion on any global issue must be taken into account by the United States, the European Union and the rest of the international community. But it also ensures real influence: it is obvious, for instance, that the situation around Syria would have evolved in a very different way if Russia, along with China, did not have veto power in the Security Council. Given that Moscow’s relative power significantly declined following the collapse of the Soviet Union, Russia is eager to make the most of the remaining resources. Even more important in the Russian view is the role of the UN, and in particular of its charter, in securing the basic principles of international law. Moscow adheres to the most conservative interpretation of the charter, which emphases state sovereignty as the cornerstone of the international system. Russia interprets this concept as a prohibition of intervention in the domestic affairs of other states. Once again, this position is explained by the relative decline of Russia’s power in the recent decades. The Kremlin is seriously concerned about what it perceives as the overwhelming hegemony of the West in world affairs, in particular when it comes to defining the key norms and principles of international society. Russia’s leadership routinely accuses the West of imposing its interpretations of universal values, such as democracy and human rights, on other people and cultures. The principles of sovereignty and non-intervention, enshrined in the UN Charter, emerge in this context as the key defense against alleged Western interventionism. Many in Russia fear that if these principles were abandoned, their country would eventually go down the same road as Libya. Defending sovereignty against such new norms as the responsibility to protect civilians becomes even more crucial against the background of Russia’s own recent domestic developments. Consolidation of the protest movement that arose after the 2011 State Duma elections along with Russia’s growing disagreement with the West about human rights and fundamental freedoms makes the country’s leadership ever more eager to embrace non-intervention. It is important perhaps not so much as a guarantee against the worst-case scenario, but as a means to de-legitimize Western support of the pro-democracy movements in Russia. Other instruments of global governance are also viewed in Moscow through the prism of its opposition to the West. Thus, Russia suspects such institutions as the G8, the International Monetary Fund (I.M.F.) and the World Bank of being dominated by the Western countries. G8 membership used to be important as a confirmation of Russia’s status as a global power, but it has recently been downgraded in importance, not least due to the fact that Russia has been repeatedly snubbed at in the context of G8 meetings. Similarly, Moscow has been pressing for the reform of the I.M.F. in the hope to reduce Western influence in this institution. 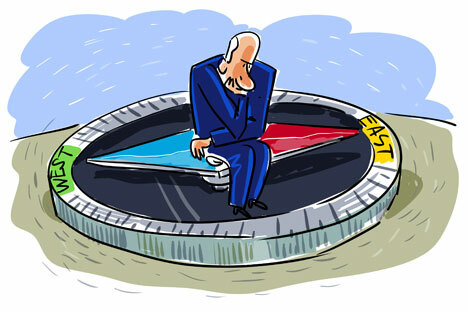 On the contrary, the G20, the BRICS and regional institutions like Asia-Pacific Economic Cooperation (Apec) are seen in the Kremlin as welcome alternatives to Western dominance in global affairs, or at least as fora where Western influence can be balanced by emerging powers and other non-Western players. Thus, Russia is enthusiastic about these structures and eagerly invests resources in their development. They are seen as buttressing the most important elements of the UN-based international system, not as alternatives to it. While in the West UN structures are often seen as being obsolete and inefficient, it is exactly these “out of date” and “suboptimal” elements that Russia is keen to preserve. It is simply a matter of perspective: from Moscow, they are seen as part of valuable legacy that forms the foundations of international order and stability, and as such need to be cherished and maintained. Vyacheslav Morozov is a professor of EU-Russian studies at the University of Tartu in Estonia.